The nation’s largest college men’s volleyball non-conference tournament is coming to Middle Tennessee in 2019. 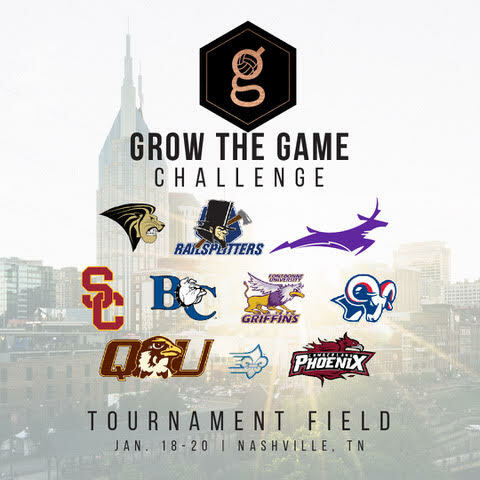 Off the Block announced Thursday that Cumberland University in Lebanon, Tennessee, will be the host site for the Off the Block Grow the Game Challenge on Jan. 18-20. The Grow the Game Challenge is an annual event that brings regular season matches to an area of the nation that does not have a NCAA Division I-II men’s volleyball team. In addition, the teams participating in the tournament range from four-time NCAA champions USC to the NAIA host school Cumberland that will begin its men’s volleyball program in 2019. The 10-team tournament field will be divided into two divisions based on each school’s NCAA or NAIA affiliation. One division will feature seven NCAA Division I-II men’s volleyball teams — Barton, Grand Canyon, Limestone, Lincoln Memorial, Lindenwood, Quincy and USC. The other division will have three NAIA or NCAA Division III teams — Fontbonne, Bluefield College and Cumberland. This is the second year of the Grow the Game Challenge. The inaugural tournament was played in January at Lipscomb University and was the first time in Nashville’s history that the city played host to a NCAA men’s volleyball event. The Grow the Game Challenge opted to move the event to Cumberland for the 2019 season in part because of the Phoenix starting a men’s volleyball program. Cumberland is the fourth college in Tennessee and the second NAIA school in the state to add the sport. Men’s volleyball is the 20th varsity sport sponsored by Cumberland, a liberal arts university that is located about 30 miles from downtown Nashville. All tournament matches will be played at the historic Dallas Floyd Recreation Center on the Cumberland campus. The Dallas Floyd Recreation Center is a 2,000-seat facility that will undergo a massive renovation a month before the Grow the Game Challenge. The arena for the tournament will feature chairback seating after the university successfully completed a $500,000 fundraising campaign earlier this year to its improve athletic facilities. The Grow the Game Challenge will have 13 matches during a three-day span. The tournament will begin on Friday, Jan. 18 with the defending Grow the Game Challenge champions Lindenwood playing Limestone. The opening day of the tournament will also feature Grand Canyon versus Barton, Bluefield versus Cumberland the night cap of USC versus Lincoln Memorial. The follow day will have a tournament-high five matches. Fontbonne will play both Cumberland and Bluefield, while the other Saturday matches will be Lincoln Memorial versus Limestone, USC versus Barton and Grand Canyon versus Lindenwood. The final day of the Grow of the Game Challenge will pit Quincy in matches against both Limestone and Barton. In addition, Grand Canyon will play Lincoln Memorial and USC will face Lindenwood to conclude the tournament. Each division at the Grow the Game Challenge will have its own tournament champion. While the tournament has a predetermined match schedule, the champions will be decided based off a team’s match winning percentage and then followed by set winning percentage and point differential. The Grow the Game Challenge operates as a non-profit organization that is based in Nashville and was started by Off the Block editor Vinnie Lopes. In addition, the organization is committed to help promoting the growth of college men’s volleyball throughout the United States. Off the Block is a national award winning website based in Nashville and is the nation’s leader in college men’s volleyball coverage.